Red Market Research was founded by Angie Ledgeway. Angie has over 20 years of research experience, having worked for several major research agencies in a senior capacity. Her experience includes working for large global organisations as well as smaller family owned businesses. 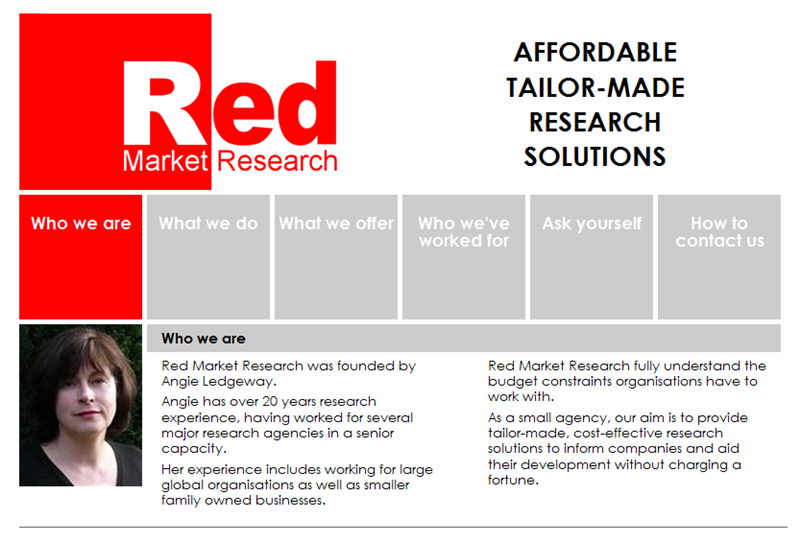 Red Market Research fully understand the budget constraints organisations have to work with and as a small agency, their aim is to provide tailor-made, cost-effective research solutions to inform companies and aid their development within a sensible budget. Tektonic Ltd. created a flat-file, micro-website for Red Market Research so that the company could have a cost-effective online presence for their start-up business and advertising requirements. As a new start up business, funds are obviously at a premium. I recognised I needed a website but didn't think I could afford one. Tektonic suggested they would be able to do something very simple which would at least get me a web presence. When they sent me the test site for approval I could not believe my eyes. They had produced a website which provided me with everything I wanted to include at a very reasonable rate. Everyone who has seen the website has commented on how clean, clear and professional it looks. Tektonic are not only technically very able but they are able to take on board and fully understand the needs of the client and translate it into an excellent end product. They provide all the support and help that a client would ever need. They are also extremely nice people and a pleasure to work with. I cannot recommend Tektonic highly enough.